One of our adventures is writing postcards and letters to friends and family. 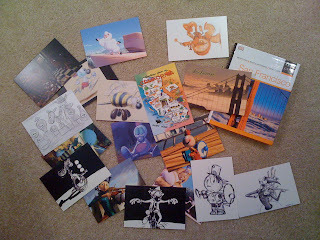 We found a box of 100 Pixar postcards for only $15 and of course we haven't come close to writing that many! But we'd love to try! This summer, send us a postcard or letter asking us a question about our new city and we promise to write back! That's a Pilgreen promise! Make sure to include your address!